The be-all, end-all guide to cooking the perfect steak -- from buying top-notch beef, seasoning to perfection, and finding or building the ideal cooking vessel. Aaron Franklin may be the reigning king of brisket, but in his off-time, what he really loves to cook and eat at home is steak. So, in this follow-up to book "Franklin Barbecue," the pitmaster extraordinaire teaches readers how to cook his favorite food to absolute perfection. 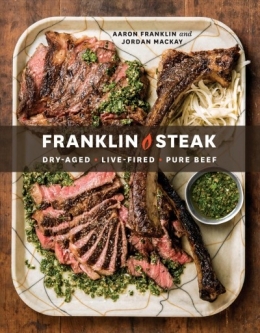 With their trademark rigor and expertise, Franklin and co-author Jordan Mackay go deeper into the art and science of cooking steak than anyone has gone before. They travel the world -- beyond Franklin's native Texas to Spain, Scotland, California, and Japan -- to uncover global steak preparations and traditions. They demystify cattle breeds, explore the technique of dry-aging, and even teach readers how to build custom, backyard grill setups inspired by the best steak chefs in the world. For any meat-lover, backyard grill-master, or fan of Franklin's fun yet authoritative approach, this book is a must-read.